This post will be an embarrassing one. I've started swimming at the YMCA in an effort to keep in shape. I think my choice of activities is partly due to residual Olympic-watching excitement, and partly due to my longstanding hatred of running without a goal to score or basket to make. Swimming, I'm also told, is among the best total-body workouts. So I hitched up the OP board shorts, grabbed a beach towel, ordered a pair of goggles from Amazon, and made my way to that chlorinated paradise. After 50 meters, I hauled myself out of the water, (practically) crawled into the bleachers, and dry-heaved until I could see straight. You see, it turns out that there is a difference between the swimming you see in the Olympics, wherein Sun Yang looks mildly under-rested after the 1,500 meter freestyle, and the swimming at the Y, wherein drowning and death are real possibilities after comically short distances. Knowing this difference didn't stop me from thinking myself exempt. First of all, let me be clear: no matter what I write in the following paragraphs (during which I will no doubt succumb to the temptation to write in such a way that you'll think I'm a good swimmer), at no point have I yet swum more than 50 meters without stopping for a rest. Really, though, it's not that I'm a bad swimmer (see? There I go...), I'm just not in "swimming shape." My stroke is good, and I'm tall, so I cut through the water fairly well. It's just that my lungs and every muscle in my body scream in unison after seven or eight strokes. The result of this is that, for the first 25 meters (one length of my non-Olympic sized pool) after I rest, I feel like Michael Phelps. For the second 25? I'm Homer Simpson finishing that package of expired ham. This binary action in my swimming has shone a glaring light on my human nature: the fact that I am both sinner and saved, loved and human, justified and condemned. As I swim up the pool after my rest, I literally find myself wondering if one of the swimmers in the other lanes will stop their own workout to tell me what a nice stroke I have, how powerful I look in the water, and have I ever considered swimming on the Y's adult team? I am not making this up...I had these thoughts this morning. As I swim back toward the shallow end, in the second 25 meters, I catch glimpses of the lifeguard on the deck, and I worry that he's going to walk up to me during my rest and say something like, "Son, are you all right? You were flailing around a bit toward the end there...you might want to think about stopping." Then I rest, watching warily for the guard...and then the process repeats itself. I literally have those self-congratulatory thoughts every single time up the pool. "I bet I look pretty good right now." Even though I wondered, not three minutes earlier, whether I would meet the crew of the Andrea Gail as I drifted into Poseidon's oblivion. This is what Luther called simul justus et peccator. We are two things at once: justified and a sinner. I am, at once, perfectly content in my ability to uphold the law: "I bet I look pretty good right now," and totally in need of a savior: "George Clooney at your grizzled handsomest...reach out your hand and save me!" As we come to grips with our dual natures, we might reach out for a savior more readily, accept another's righteousness more freely, and actually make it to the end of the pool. Note: This morning (after having written this last night) I swam my first 100 meters without stopping. What's the record for gold medals in the Olympics again? Asking for a friend. Good luck on getting in shape! My advice (not that I'm particularly athletic myself) is to go for endurance first, then speed. First and foremost your heart has to get in shape to deliver oxygenated blood to your soon-to-be bulging quads and biceps. - If you're tired after 100 meters, you're probably going too fast. Actually, if it's physically possible for you to swim any slower, you're going too fast. - In the beginning, work on stringing multiple shorter swims back to back, with smaller and smaller breaks, rather than going all-out at once. E.g. three+ 25meter swims with 30 seconds in between rather than one 50 meter swim. I'm trying to get back into 5k shape by October. Oof. Ha! That totally makes sense though! 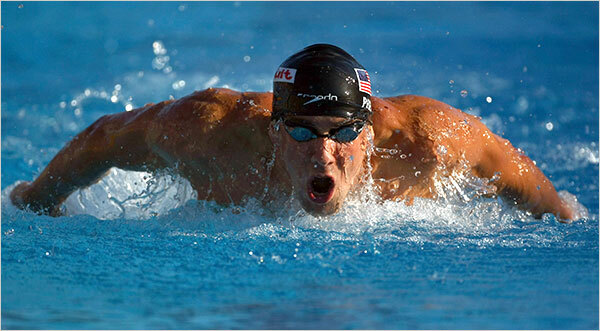 Swimming uses many muscle groups all at once, so it demands way more oxygen from your blood than say running or playing basketball. Just go slow :P You can go back to going fast once your heart and lungs are prepared for it.